A member of the Presidium of the House of Representatives, first deputy speaker Hassan al-Kaabi, on Sunday, Chinese companies to contribute to the reconstruction of cities liberated from the grip of the organization calling for the terrorist. "The Kaabi met with his office the delegation of the Foreign Relations Department of the Central Committee of the Communist Party of China, under the chairmanship of Lee Jun, deputy minister of the department, accompanied by the Chinese ambassador to Baghdad, Chen Wicheng," the media office of the First Deputy Speaker of the House of Representatives said in a statement received by Mawazine News, . "Relations between Iraq and China are historic," he said. "The relationship between Iraq and China is historic. It is positive that this relationship did not witness a decline or a break in a historical stage, but on the contrary it continued to develop for the better. The two sides stressed "the importance of the strategic agreement which is expected to be signed during the coming period, and the volume of trade exchange between the two countries, which exceeds 30 billion dollars annually." "There should be additional calls for Chinese companies to contribute to reconstruction projects and China's contribution to the development of some Iraqi economic sectors, especially the energy sector (oil and electricity). For his part, Deputy Minister of Foreign Relations Department of the CPC Central Committee, Lee Jun, said that "
"Our country's duty is to provide support to Iraq and to contribute to the reconstruction of liberated cities and to benefit from experience in overcoming many of the problems that China has already suffered, such as poverty reduction, development and service problems," Lee said. delegation representing the ruling Communist Party of China (CPC) arrived in Baghdad on Tuesday to discuss Chinese investments in the reconstruction of liberated areas. Chinese Vice-President of the Iraqi Parliament Hassan al-Kaabi and a representative of the Iraqi Foreign Ministry, Hazem al-Youssafi, discussed "the coordination of Iraqi-Chinese cooperation in the areas of reconstruction, security and economy." 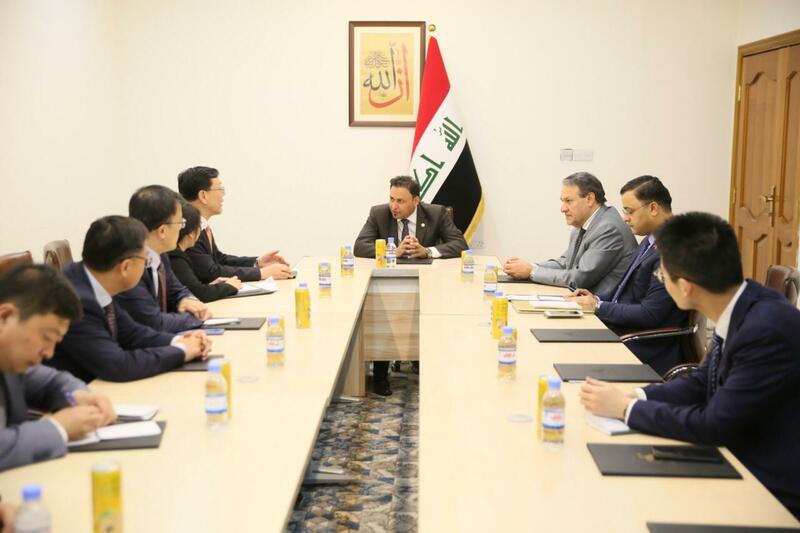 The Chinese delegation, led by Deputy Foreign Minister Li Yun of China's central government, discussed improving relations with Iraq as China is one of the first importers and consumers of oil in the world, especially from the Iraqi source. "We have a duty to provide support to Iraq and participate in the reconstruction of cities liberated from the organization is urging. It is noteworthy that the volume of trade exchange between Iraq and China has amounted to thirty billion dinars annually.